I was in Kathmandu one Friday evening and found my self in the rather famous bookstore known as Pilgrims which is a feast for any Indological book lover! I was looking for a rare book on Ayurvedic herbs which I had seen there some weeks back and could not find it again but I stumbled upon this book and with such glee and delight I opened and turned it's pages. 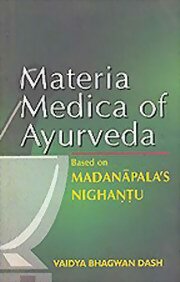 This book is an epic materia medica and for anyone interested in going deep into Ayurveda and it's beautiful understanding of all substances (from rain to wind to gold to various plants, minerals and metals), then this is the book to start. It's filled with many chapters detailing each kind of substance. It even has some recipes from the very ancient times it was written which are fit for a king and to bring health to those who are in need of it. I highly reccomend this and all of Vaidya Bhagvan Dash's books to any student of the Science of Life - Ayurveda. I was in Kathmandu one Friday evening and found my self in t ..